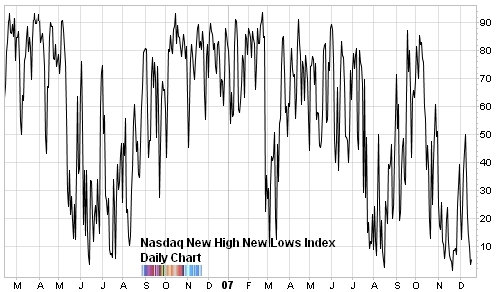 Can The New High-New Low Indicator Do It Again? 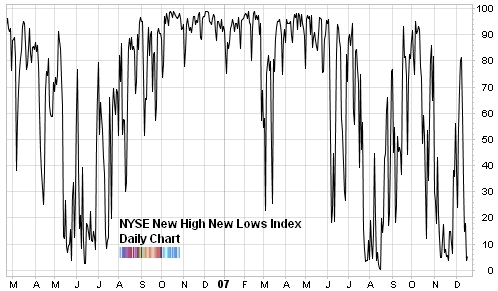 Let’s see if the new high-new low indicator can do it again. About a month ago (November 21st to be exact) I noticed that the new high-new low indicator was flagging an inflection point in the market. As a quick refresher, the new highs-new lows indicator is calculated by taking the new highs in an index or market and dividing by the sum of the new highs and the new lows. On November 21st the S&P 500 index closed at 1416.77 (green arrow) — within two days, the market action took the index down to 1407.22 (on November 26th). And that was it. From there on it started to climb. Except for a slight pause, it went all the way to 1520. Yesterday’s close took the indicator for both Nasdaq and the NYSE down to less than 5%. Those are abysmally low numbers which means we are very oversold and close to an inflection point. The days between xmas and new years is the best week of the year period! So I will buy at thursdays close and hold till the first week of the year or longer. Been waiting for seasonality to kick in for a while now. This paper studies tests of calendar effects in equity returns. It is necessary to control for all possible calendar effects to avoid spurious results. The authors contribute to the calendar effects literature and its significance with a test for calendar-specific anomalies that conditions on the nuisance of possible calendar effects. Thus, their approach to test for calendar effects produces robust data-mining results. Unfortunately, attempts to control for a large number of possible calendar effects have the downside of diminishing the power of the test, making it more difficult to detect actual anomalies. The authors show that our test achieves good power properties because it exploits the correlation structure of (excess) returns specific to the calendar effect being studied. We implement the test with bootstrap methods and apply it to stock indices from Denmark, France, Germany, Hong Kong, Italy, Japan, Norway, Sweden, the United Kingdom, and the United States. Bootstrap p- values reveal that calendar effects are significant for returns in most of these equity markets, but end-of-the-year effects are predominant. It also appears that, beginning in the late 1980s, calendar effects have diminished except in small-cap stock indices. I repeat the last sentence: It also appears that, beginning in the late 1980s, calendar effects have diminished except in small-cap stock indices. Don’t always believe the hype. Or in fact, most often don’t trust the hype. Johan, we got a small bounce up to the 2725 area on the Nasdaq which was the prior swing high and that was it. I thought it was supposed to be a longer term signal, and not a one week signal. But in that case it really nailed it. My mistake!